Welcome to Junior Leafe. On Saturday 6th October 2018 Whyteleafe FC Foundation will be launching our new Junior Leafe annual membership scheme. Costing just £25.00 until 31st August 2019, our Junior Leafe membership package has arrived with a whole range of savings - bringing more benefits to young Whyteleafe fans. As a Junior Leafe, you will also have access to our Junior Leafe section on our main club website, keeping you up-to-date with all the latest news from Church Road. Our Saturday Morning Soccer School will also be expanding, by giving girls the opportunity to take part in a Girls Only Session on a Saturday morning. Junior Leafe members will also receive a monthly Junior Leafe newsletter on the first Saturday of every month. This will introduce the coaches that coach your children on a Saturday morning, more information regarding pathways to Whyteleafe FC teams and other events which we provide throughout the week. So sign up today. Each child will receive their membership package in the post no longer than two weeks after joining. We look forward to having you on board and the opportunity of taking the advantage of everything that we have to offer. 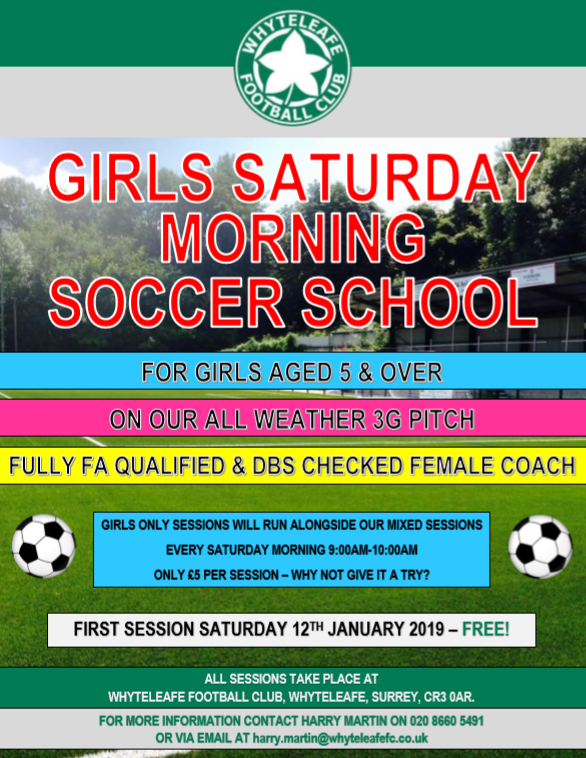 Whyteleafe FC have started 2019 with a bang by launching our brand new Girls Saturday Morning Soccer School which is run by our Foundation team. Our brand new session will take place on the Whyteleafe FC main pitch which the first team and Ladies use. Yes, your child will be learning the beautiful game on our new FIFA Quality stadium pitch! Every Saturday morning. 9am-10am. The first session is FREE and the launch date will be Saturday 12th January 2019. 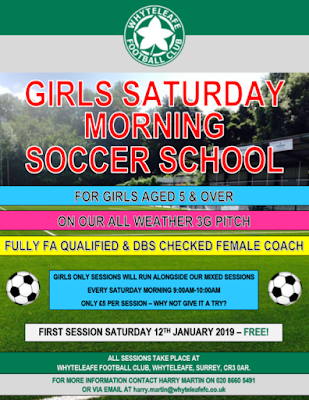 Whyteleafe FC Girls Saturday Morning Soccer School offers football coaching for girls aged 5-13 and introduces them to the beautiful game on our state-of-the-art FIFA Quality pitch located inside the stadium of Bostik League South Whyteleafe Football Club. Whyteleafe FC Girls Saturday Morning Soccer School takes place on our new super safe, child friendly FIFA Quality 3G pitch located inside the stadium! Address: Whyteleafe Football Club – Church Road, Whytleleafe, Surrey, CR3 0AR. Whyteleafe FC clubhouse and tuck shop will be open from 9:00am serving full English breakfast, rolls and sandwiches as well as hot drinks. In our clubhouse you can also catch up with Sky Sports News on our three tv screens, access our free WIFI, read the mornings newspapers or head down to the pitch with your take away food and drink. Plenty of drink and suitable clothing. T-shirt and shorts are fine but we advise parents to bring along tracksuits and warm clothes as the weather can change quickly! Astroturf boots or football boots are recommended but NO METAL STUDS. Shin pads also preferable. With one of the best all weather FIFA Quality 3G pitches in Surrey we’ve never had a session cancelled in our six years of operation. Rain or shine we’ll be running and open as usual!